For starters, I ordered a good amount of curly mustard greens seeds. I got 1/2 lb of seed for a little less than $8. My supplier gets the seeds cheaper at a feed store, but it's fine because they don't charge for shipping. Additionally, like the last two times, I needed a pastry tray to contain the seeds and the water necessary to germinate them. Unlike the past two times, I will be using paper towels as my growing media. Soil didn't work out too well and I don't have enough rockwool to use (I should say I don't have a good supplier or lots of money to blow on it yet). Paper towels is an easy option because they are much cheaper than the other two methods, retain moisture well, and are easy to dispose of when done. First the tray needs have any dirt, crumbs, etc cleaned out before any work is done. Fortunately for us, the paper towels were the exact same length as the tray. To make the wicking mat, we stacked two paper towels and folded the stack in half lengthwise. Then we added some water to the wicking mat to get it nice and saturated. We took two more paper towels, unfolded and laid them across the entire tray. By now, water began to spread across the new paper towels. Honk if you passed fluid mechanics! Once the new towels were moist, it was time to add the seeds. Using a measuring cup, the seeds were carefully poured over the surface of the wet paper towel. Do your best with spreading the seeds. It isn't easy to move them once they are on the paper towel. Don't sweat it if they clump too much or are spread too far apart. Once the seeds are in position, an optional light misting can be applied to encourage germination. Add the humidity dome and place in a spot where the tray cannot be knocked over. Once the seeds germinate (about 2 days), the tray is relocated to have more exposure to light. In two more days, the seeds should have started to grow. The white stuff around the seeds are roots (not mold). I learned the hard way that it really isn't necessary to remove the humidity dome. I did it for one night and all the sprouts were drooping. Luckily, adding a little more water and recapping the dome solved the problem. Once the sprouts are ready (7-11 days), it's time to harvest. Using a scissors, the sprouts were cut from the wicking mat and assembled in the feed dish. We cut maybe a 1/6th of the total sprouts in the bowl. Even though they probably don't need to be washed, we did it anyway and used the water to rewick the mat. We tried feeding our ferocious friend some of the microgreens by hand. He took some, but I think this is a food item he'll have to go eat on his own. I've been told bearded dragons can be really picky, so it might take some time getting used to eating vegetables like this. Of course, if you don't have a bearded dragon to feed, you could use these microgreens in your own salads or sandwiches. They have a good, slightly spicy, flavor kick to them. Our reptilian friend accepted these into his diet, so we'll have to start a production line to keep a constant flow of food to him. Delicious and nutritious nom noms for Drogo. 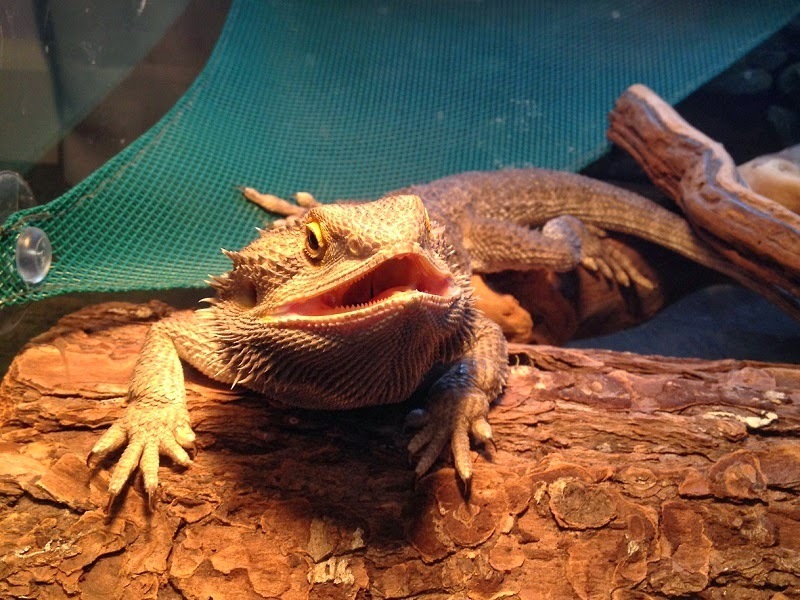 My beardies name is Poko!